A group of frogs were traveling through the woods. Two of them fell into a deep pit. 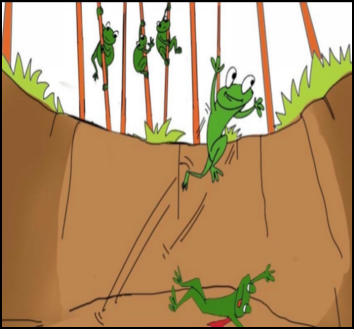 When the other frogs saw how deep the pit was, they told the two frogs that they were as good as dead. 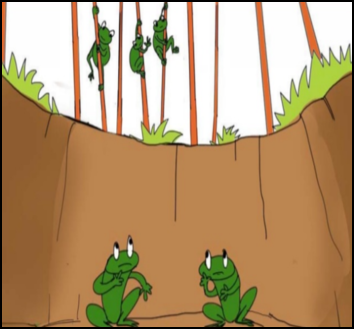 The two frogs ignored the comments and tried to jump up out of the pit with all their might. The other frogs kept telling them to stop, that they were as good as dead. Finally, one of the frogs took heed to what the other frogs were saying and gave up. He fell down and died. Moral of the story: An encouraging word to someone who is down can lift them up and help them make it through the day. One encouraging word can go a long way. Reblogged this on Kunal Rane. Must be from the Hip Hop version of scripture. Such good words can make the difference between life and death within.